When is it acceptable in your play-by-play broadcast to criticize the refs? I remember hearing the play-by-play voice of a major university railing on the refs about a call he insisted they missed. He went on, ad nauseam. The next day’s newspaper account of the game explained why the ref’s call on the controversial play was correct. Don’t rely on the reaction of players to determine whether the official got it right. Players regularly disagree with calls. It’s not proof the refs are screwing up. Describe the reactions of players, coaches and fans if you think the ref missed a call. If you’re doing high school or small college sports or rookie league baseball games, there’s a good chance you’re early in your career and still learning the ropes. It’s equally reasonable that the referees and umpires for those games are, too. Cut ’em some slack. If a broadcaster regularly criticizes the umps, listeners will start to wonder if the issue is more with the broadcaster and less with the men in stripes. So, what’s the best way to convey that a ref might have missed one? Do it by describing the reactions of players, coaches and fans. There are a variety of different opinions on this topic. I would love to hear what you have to say. Please use the comment section below to tell share an example of how you handled it when it looked like a ref missed the call. I promise to reply to each comment. What if as a Play-by-Play, the Color Commentator disagrees with an obvious missed call? For example, I had a situation during a broadcast of a high school football game where on 3rd and long, a quarterback dropped back to pass and was immediately corralled by the defense. Said quarterback, who was inside of the hash marks, and in the process of being spun around by a defender, threw a desperation pass (Which appeared to be more of a lateral because he could not generate enough momentum to get an overhand throw off) in an attempt to avoid the sack. The pass did not reach the line of scrimmage, and there was no receiver within 20-25 yards of where the pass landed, as they had gone 5 wide and run routes intended to reach the first down marker. No whistle blew, and as such, a defensive player picked up the ball and ran into the end zone for a touchdown. 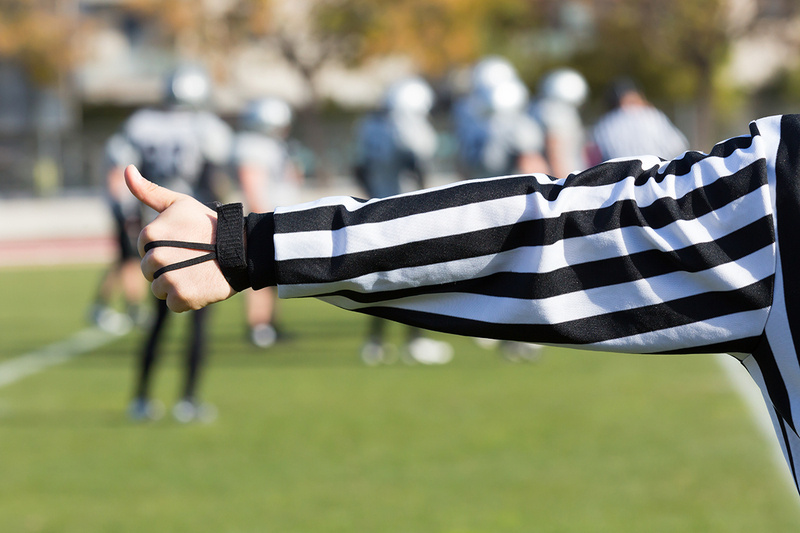 The officials signaled touchdown on the field, and the team was lining up for an extra point when the coach of the offensive team came onto the field and started lobbying the officials. The officials discussed the play and determined that the play was an incomplete pass instead of a fumble, but then also either forgot to asses the penalty for intentional grounding, or decided against it. The coach for the defensive team was penalized for arguing this point (As we confirmed after the game), and with the ensuing play, the offensive team scored, took the momentum and went on to come back and win the game. The color commentator made very cogent points about that series of calls and stated their disagreement with them, and to the best of their ability (They were an alumnus of the school that was stripped of the touchdown), continued with the broadcast in a professional manner (We did re-hash the call/series of calls after the commercial break following the ensuing touchdown to recap, with my color commentator again stating their disagreement, and in the post-game when we recapped the scoring). My question is, at what point (If ever) is it okay to allow a color commentator who played to state their opinion on officiating, as they did in this instance, during a broadcast? And what is the limit for such a venture? I did it a few weeks ago for a hockey broadcast. There were two instances. The team I broadcast for was down by a goal with about 6 or 7 minutes left. They took a penalty, but touched the puck moments later which should’ve meant a delayed penalty and immediate whistle for a faceoff. The referees ignored this and let play go on (with the opponent enjoying even extra time as they pulled their goaltender) for a solid minute after my team touched. Huge miss. The opposing team did not score on the power play, but very well could have after pulling their goalie and the refs never blew the play dead. In that same game, my team pulled their goalie to try and tie the game at 2 and send it to overtime. The referee dropped the puck, 5 or 6 seconds went off, and they decided to re-drop the puck. Neither the referee or linesman checked the time on the scoreboard with the scorer’s table. Hockey is so fluid, but who knows what would’ve happened if those 5-6 seconds had gone back on the clock; that game could’ve gone to overtime. I think when it’s a time issue they blatantly screw up, that’s deserving of criticism.